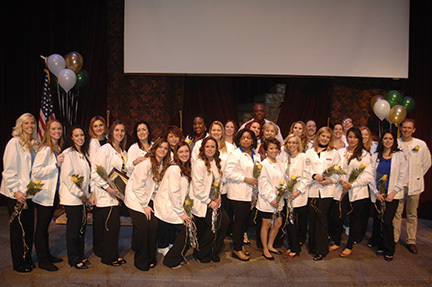 WEST WINDSOR – Students, faculty, staff and family joined in the graduation celebration of 29 Mercer County Community College Nursing students, who received their diplomas Jan. 13 and now begin a challenging and rewarding career as health care professionals. The Nursing Education Pinning Ceremony is the ceremonial last step before the graduates take their certification exam and move into careers. And it is no small accomplishment, according to MCCC Vice President for Academic Affairs Dr. Eun-Woo Chang. Christine D’Angelo, class valedictorian, noted the long hours, hard work, and challenges each of the graduates faced – as well as the impact on family members. “It has been a long, hard road,” D’Angelo said. “There have been some real sacrifices our families have made for us to be here today. The MCCC Nursing class of January 2015. 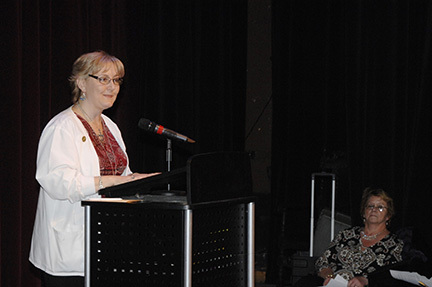 Nursing valedictorian Christine D'Angelo relates her personal challenges during the MCCC Nursing Education Program pinning ceremony Jan. 13. “Now, the girl that did not live up to her potential, the girl who quit, who ruined her live, has survived Nursing school,” D’Angelo said. “Not only is she a nurse, but valedictorian. I didn’t even know there was a valedictorian!